Never in my life have I craved kimchi as much as I have the last few weeks. I may not have a jar of kimchi on hand to satisfy this craving, but I have flavored seaweed snacks, so those will have to do. I've reviewed quite a few Tao Kae Noi products, and the packaging always follows the same layout and overall design. 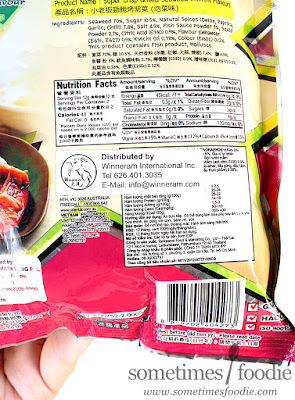 At this point there's nothing really new or different about this bag for me to discuss, other than the cute little kimchi illustration, but overall, this brand is always nicely presented and you get a generous portion of seaweed snacks for your money. Once opened, it doesn't really smell like anything. If I really shove my face into the bag the seaweed's coating smells sweet and garlic-heavy, with a hint of Takoyaki sauce. Very appealing. 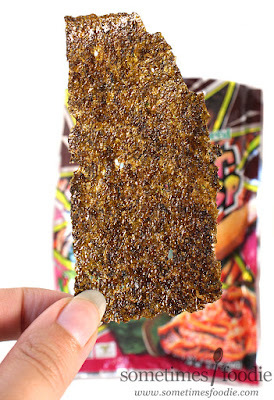 I fished a few sheets out to snack on and they look like any other seaweed snack out there. Thin, crispy, kind of green-colored, with a hint of seasoning or some kind of flavored coating on top. I'm pretty sure I say this about every new seaweed snack flavor I try but...this is my new favorite! I can't stop eating it! Like all seaweed snacks, the texturing is crispy and thin with a really satisfying crunch, but the glaze-style coating is impressively bold. This stuff starts out tasting sweet and garlicy, very similar to a sweet chili sauce, but before you know it the heat hits you right on the sides of the tongue and a little towards the back of the throat. That heat, and the caramelized garlic flavoring, lingers! 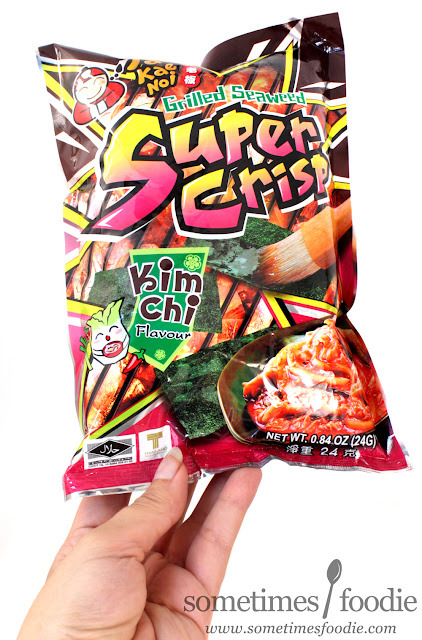 Which is bad news for anyone you'll be talking to after snack time (kimchi breath) but for me, that lingering flavor and heat kept me coming back for more. The general heat level would be medium-hot for me, but as you snack it builds to a dry hot chili pepper heat that really packs a punch. After a few handfuls I needed to take a break and let me tongue recuperate before going back in for round two, but even so...I just couldn't stop snacking! If you love spicy Cheetos, Hot Fries, and other spicy snacks, you'll love these, and it's now the favorite hot seaweed snack flavor! Definite repurchase, and I plan on recommending this flavor to my seaweed snack squad. (AKA, my friends.) However, if medium salsa has you chugging a glass of milk (FYI milk is better to drink when combating spicy foods than water) this, although delicious and flavorful, just isn't the snack for you.